Congratulations to Elizabeth Erazo. You have one week to e-mail me your physical address, or a new winner will be selected. Everyone else -> stay tuned. There are going to be at least two more giveaways coming up! Alright - it's time for Spring Giveaway #3. This time I have a variety of items from Pilot, Bic, Zebra, Sharpie, Zig, and Uniball. 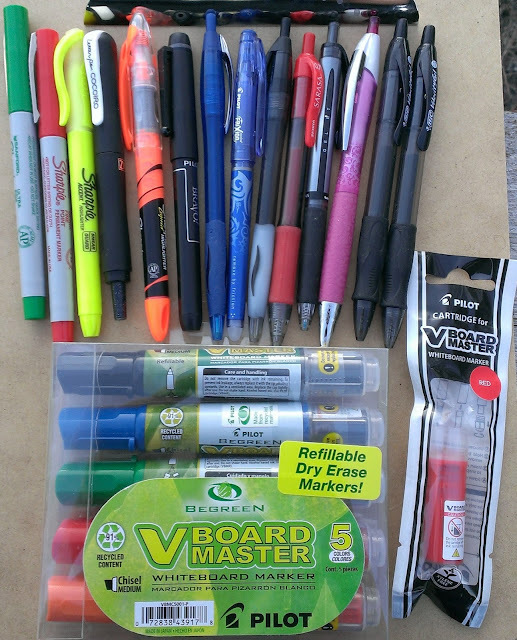 Some of these items I have reviewed, and the rest are just extras. Some might even call this a Spring Cleaning Giveaway, and that's not far from the truth! I will have some repeat items in these giveaways just because I received multiples, but that gives me the chance to get more stuff out in the mail. As for the rules, this will be for U.S. visitors only (shipping costs and issues with Customs being the limitation). You only need to leave a comment (one per person) on this page. If you'd be willing to share this opportunity on whatever social media you use, that would be much appreciated! This giveaway will run until Sunday, April 29th. The cutoff will be 11:59 pm, CST. Good luck! A while back I decided to learn how to write using Blackletter script, and found myself looking through lots of examples of Gothic and later Germanic scripts. The most commonly (and recently) used Blackletter form was Fraktur, which was the script commonly used throughout Germany and the former reaches of the Holy Roman Empire. It was a whole class of typefaces that was used in everyday printed works, and was used in a less ornate or cursive form for everyday written communication. 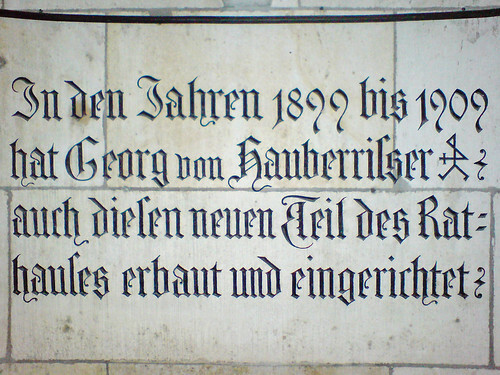 Fraktur, as the name might imply, is “fractured” in the sense that letters are not formed in a continuous line as they are in Antiqua typefaces, but instead are formed by a number of discontinuous strokes that give Fraktur its characteristic blocky look. - - Put your paper on an angled surface. It doesn't have to be much, and you don’t need to buy special equipment; even just the 20-30 degree incline that you get from putting piece of paper on a clipboard and raising the end on a thick book will make a world of difference to encourage good posture and technique. - - Use an appropriate pen. You want something with a relatively flexible nib. You can obviously practice with anything you want, even a pencil or a ballpoint pen, but using a pen that will vary in thickness depending on your pressure and movements will provide instant feedback on whether you’re placing each stroke in the correct way, because you won’t be able to get the varying line thickness to match if you’re doing it wrong. - - Lift your elbow. If you’re like me and you've had your own way of doing things because it worked for you in the part then it’s time to bend to ancient wisdom. You want your shoulder muscles to be engaged in the writing process. Doing so will make your writing look more uniform, even if it feels awkward at first (also you’ll get some sore muscles). Once you feel comfortable with the letters to the point that you can remember how to write each one without going back to look it up it’s time to practice in earnest. The only way to master it is to write, and to write a lot. I sat down and wrote a page or two of whatever came into my head every day, which was mostly total nonsense, but if you don’t like having to sit down every day to practice with no practical purpose you can hone your skills by shifting some of your everyday writing tasks to your new lettering styles, from grocery lists to writing notes for friends, family, or roommates. Alice Jenkins is a writer, graphic designer and marketer. When Alice isn't nitpicking her own logo designs, she writes about social media, small business branding and fashion design. Alice's internet writing adventures are funded by Pensxpress, a business that specializes in personalized, imprinted pens. Alright, so the winner of the giveaway was Steve, with comment #23. Congratulations! There was one comment after the deadline, so that was not included in the drawing. Steve, you will have one week from today to send me your address or a new comment will be selected. To everyone else, stay tuned; I will have another giveaway posted soon, probably by this weekend.